"I have been making this stew for more than 20 years. It's a dish I use to celebrate the harvest season. It may be a bit labor-intensive, but it is worth every minute! Experiment with different root vegetables, and use the dumplings in other hearty stews or soups. They are so yummy!" Arrange pork pieces one layer deep in a large baking pan. Broil, stirring often, until meat is browned, about 10 minutes. Pour off and discard the fat. Heat vegetable oil in a Dutch oven or large skillet over medium heat. Stir in onions; cook and stir until the onions have softened and turned translucent, about 5 minutes. Add garlic and cook, stirring frequently, until the garlic is fragrant but not brown, 2 minutes more. Stir in potatoes and cook for 5 minutes. Pour in water, beef bouillon, sliced carrots, chili powder, marjoram, 1/2 teaspoon thyme, bay leaves, nutmeg, 1 teaspoon salt, and pepper. Bring to a boil, then reduce the heat and cover. Simmer until the meat and all of the vegetables are tender, about 3 hours. To make the Sage-Cornmeal Dumplings: combine flour, cornmeal, sugar, baking powder, sage, 1/4 teaspoon thyme, and 1/2 teaspoon salt in a large bowl. Cut in the shortening until the mixture resembles a coarse meal. Add milk all at once, stirring just until the mixture holds together. When the stew is ready, remove the bay leaves. Bring the stew to a gentle boil over medium-low heat. Drop the dumplings by rounded spoonfuls evenly over the surface. Cover the pot and boil for 12 minutes, until the dumplings are cooked through. Ladle the dumplings into soup bowls and top with lots of stew. Now here’s what we should be eating for St. Patrick’s Day! Loved the flavor. However, my dumplings disintegrated in the stew. I cooked the dumplings according to the time in the recipe. Next time, I will not cook the dumplings as long. Awesome! Perfect for a snowy evening. The dumplings are so flavorful, and thicken the broth perfectly. Great stew! I have made it twice so far. I added parsnips and sweet potatoes also. 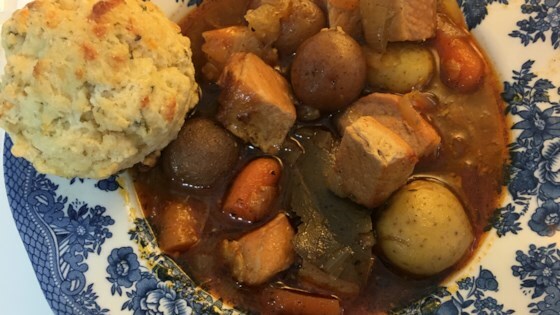 I used less milk and the dumplings were perfect. You might want to double the dumpling recipe. We ran out.